It’s a long time since I read Crime and Punishment and I’ve been meaning to read more Dostoevsky since picking up R N Morris’s historical crime series in which Porfiry Petrovich once more takes a starring role. However, not only are the major works incredibly long, I didn’t have any to hand when I decided to join the latest classics circuit tour. I did, however, have the Doestoevskian contribution to the excellent Melville House Press Art of the Novella Series. At 210 pages, this is the longest of this series to date but pretty short by Dostoevskian standards. Written timewise between The Idiot (688 pages) and The Devils (800 pages), it is, therefore, a mature work and has been described by Alfred Bem as “one of the most complete works by Dostoevsky in regard to its composition and plot development”. Certainly its structure is tight, classical even. Its all there – exposition, complication, rising action, culmination, catastrophe, denouement and epilogue – measured out, evenly paced, controlled. The same cannot be said for the plot which is, in summary, utterly bizarre. Many years ago, Velchaninov had an affair with his friend’s wife. When she took up with a younger lover, Velchaninov left and they never saw each other again. Following her death, her husband Trusotsky turns up on Velchaninov’s doorstep, but his motivation is unclear. Does he know? Is he seeking revenge or is his professing of undying friendship to be taken at face value? In the psychological duel which ensues between two entirely unsympathetic characters, there are so many inconsistencies of behaviour, emotions swinging from one extreme to the other, often on the same page, that I was as bewildered as the author wanted me to be. I know that’s so because when the key is revealed, in the very last paragraph of the denouement, everything drops into its rightful place. Foreshadowings, motivations, and the answer to whether Trusotsky is the eternal husband, “a husband and nothing more”, merely “a supplement, even when he has an unmistakable character of his own”. If I didn’ t have such a massive TBR, I would probably go back to the beginning and read through it all again as I’m convinced it will improve on a second reading. 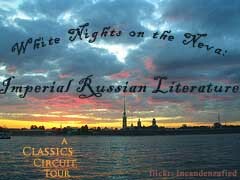 This post is part of the White Nights on the Neva Classics Circuit tour. Full details here. I think much Russian literature is better upon second reading. Unfortunately, it is all so long…..I have LOVED Crime and Punishment, and have read a few times. This sounds like another classics, albeit a different type. Thanks for your thoughts! I actually have “Crime and Punishment” now sitting upon my TBR shelf and am thinking I’ll bump it up on my reading queue based upon your review of another of his works. Never having read anything by Dostoevsky I admit to my curiosity being piqued. Thanks for the review! Do enjoy “Crime and Punishment”, Kimberly. It is superb! I know how that TBR pile keeps us from re-reading! this sounds like it might be a good introduction to Dostoevsky because it’s a shorter work (and one of his more mature one, as you say) — I haven’t yet read him. Like you, I immediately wanted to go back to the start, and watch what I knew was unfolding unfold. Great review.